Days after CCTV footage of a dog called Snoop being turfed out of a car went viral worldwide, animal cruelty investigators are probing two new cruelty cases in the city. 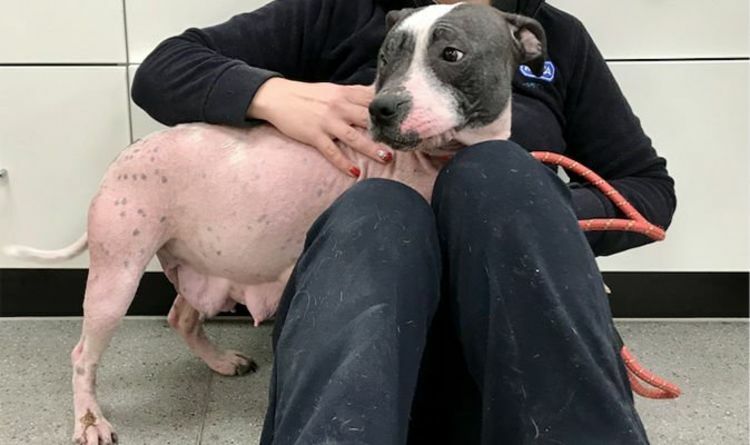 One involves a dog left dying in a ditch while the other sees the RSPCA trying to trace the owners of nursing mother dog dumped by a busy road. The case of Snoop the Staffordshire bull terrier-type pet shocked animal lovers globally after CCTV images showed a man getting out of a car with the pet and its bed then deserting the animal on the pavement on the other side of the road. Pitifully, the dog climbs up at the car wagging its tail before the vehicle drives away. Since the RSPCA rescued the black and white dog, there has been a clamour by animal lovers to own him. Even superstar rapper Snoop Dogg has been reported offering him a new home. The RSPCA revealed today it is investigating two new but unconnected cases from the city. A male Jack Russell type-terrier was found dead under a bridge on the A527 near the Chatterley Whitfield Estate last weekend. Not only was the dog severely emaciated, it is believed he had spent much of his life in a cage because of the condition of his claws. He also had matted fur that had never been brushed, was covered in sores and had urine scald burns. It is believed he died in the ditch. On Wednesday, an almost bald Staffie was found wandering near the busy A50 Uttoxeter Road, one or two days after giving birth. There are now fears her puppies will not survive without her milk. Inspector Charlotte Melvin, who is investigating both cases, said: “I am keen to trace the people responsible for both of these horrendous abandonments, which come just days after the high profile case of Snoop. The Staffie has been nicknamed Peppa because her bright pink skin reminds her RSPCA carers of the children’s cartoon favourite, Peppa Pig. Because rigormortis had not set in when the Jack Russell was found, it is believed he had been left to die in the ditch. Inspector Melvin continued: “It is disgusting that it appears this poor pet had such a terrible start to life and it seems he was left to suffer from neglect for most of it. “From the state of his claws it appears he has never been walked and was probably left in a cage all his life. “Clearly he had not been fed properly, cleaned or had his hair brushed which left it severely matted and he was clearly left untreated when suffering from severe diarrhoea. The investigation, meanwhile, continues into Snoop’s abandonment at the corner of Timor Grove and Pacific Road in Stoke-on-Trent on December 17. An RSPCA spokesman said: “Snoop is such a lovable character but isn't available for rehoming just yet as he has recently moved to one of our centres, where our staff can properly assess him to make sure they know exactly what they will need to look for to find his forever home. * Anyone with information about any of the cases is urged to call the RSPCA’s confidential appeal line on 0300 123 8018.